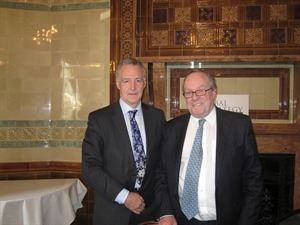 Professor Michael Clarke, Director-General of RUSI, gave our second May lecture on 22nd May, in an event chaired by Lord Lothian. He opened his lecture by drawing attention to a new dynamic for Europe, which we have yet to come to terms with: after generations of being defined along an east-west axis, Europe was now defined along a north-south axis. Professor Clarke described the eurozone crisis as ‘cumulative crisis moving faster than our political processes can deal with’ and rejected the idea of a choice between a ‘policy’ of growth versus a policy of austerity, pointing out while austerity is self-implementing, growth itself is not a policy, but rather an outcome of a series of other decisions. He said that the severe austerity in Southern Europe and the acrimony in Northern Europe was now raising questions over the future of the EU and forcing debate and discussion on federalism. It was a ‘dramatic moment’ and would be a ‘dramatic year for Europe and the EU’. He could envisage a situation in which, if the euro was saved because Germany created a northern European eurozone, then the EU would revert to something like the original grouping of six. With high levels of youth unemployment under 25 across Europe, social dislocation, rioting and contagious violence spreading from country to country was possible. He said that RUSI was currently researching how this will translate in terms of human insecurity and had identified five broad areas of concern: the crisis of governments becoming a crisis of governance; uncontrolled migration from south to north; an increase in serious organised crime; that rise in crime creating easier transmission mechanism for terrorism; and the issue of unaddressed crises, as the stabilising ‘magnet’ of the EU increasingly lost force, particularly insofar as its ability to demonstrate red lines to Russia was concerned. Just he could envisage a scenario whereby the EU might shrink, so too with NATO. Despite the declarations of the NATO summit, he anticipated that a smaller core of countries in NATO would emerge, for whom NATO was important and who would work hard to keep NATO alive, while other countries might start to renationalise their forces for use as border guards, for instance. On the US’s position, he said while the US was very interested in the European economic crisis, the pivot to the Pacific was not all rhetoric and it reflected a ‘long-term reality which we have to take seriously’. Should the European economic crisis become a security crisis, unless US interests were genuinely threatened, we would be ‘on our own’. He felt that the crisis threatened to make us very introspective, meaning that Europe would play relatively little role outside its borders, in what is happening in the Middle East for example. And as the narratives continued to break down in Europe – who is to blame and what has created the present situation, the crisis would become a battle of the narratives.